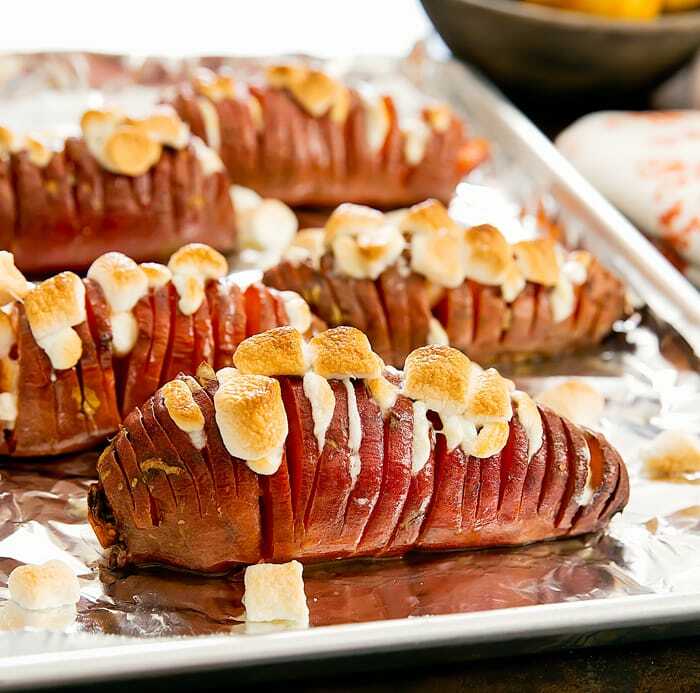 Individual marshmallow stuffed hasselback sweet potatoes are a fun spin on a classic sweet potato casserole for a Thanksgiving side dish. Thanksgiving is just a few days away and I have a few more recipes to share before it gets here. 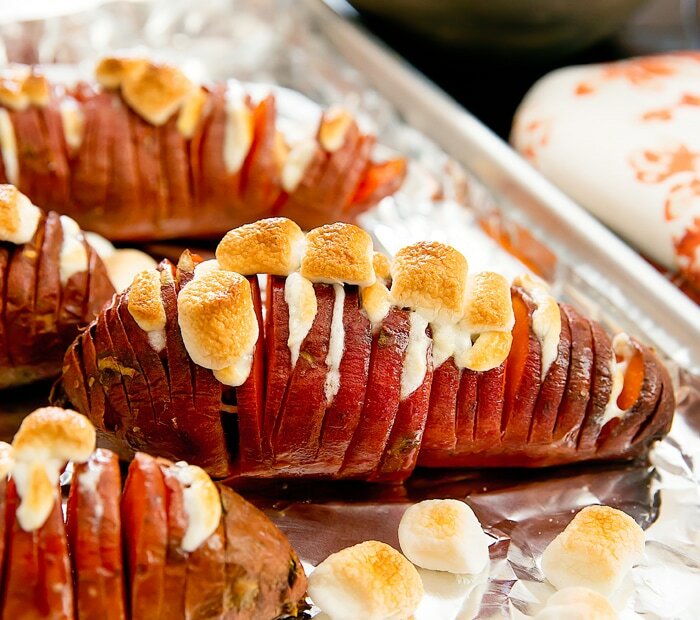 As you call, I’ve already shared my hasselback maple pecan sweet potatoes. And while I really love that recipe, I thought it might be fun to play around with another version. I have to confess, marshmallow sweet potato casserole is not a dish I’ve ever made. But I do really like how these came out. 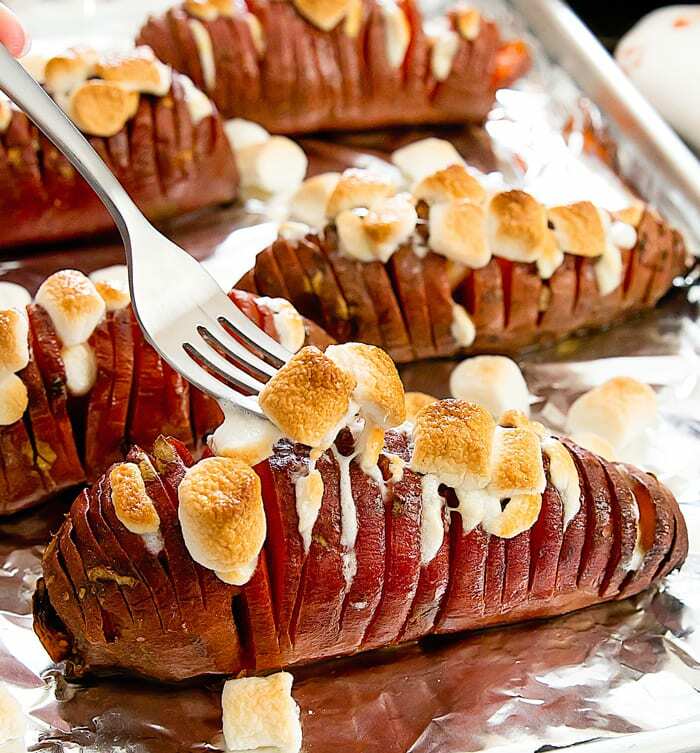 The hasselback sweet potatoes are stuffed with mini marshmallows that melt in the oven for a gooey finish. I didn’t add too much else because I didn’t want these overly sweet. To cut sweet potatoes, use a sharp knife and starting from one end of the sweet potato, slice slits about 1/4 inch wide, but make sure you do not cut all the way through. Cut about 3/4 of the way down for each slice. Repeat with all sweet potatoes. Brush tops and sides of sweet potatoes with olive oil. 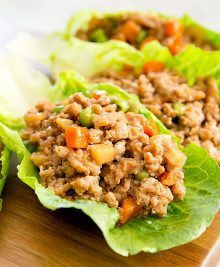 Place onto prepared baking sheet. Bake for about 40 minutes or until sweet potatoes are tender. Remove from oven and reduce temperature to 375°F. Allow sweet potatoes to cool enough to be touched. Stuff each sweet potato with about 15 mini marshmallows (about 10 inside and 5 on top). 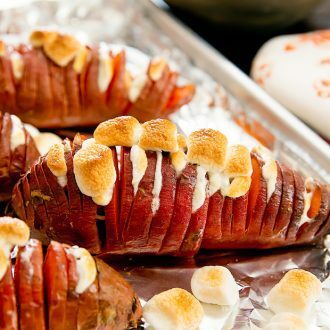 For the marshmallows being stuffed inside, rip them in half and then push them in between the slits of the sweet potato. You don't need to insert a marshmallow piece in between every slit. I stuffed mine in between every other slit. Place back into the oven and cook for about 10 minutes until the marshmallows stuffed inside are melted and the ones on top are toasted. Serve warm. 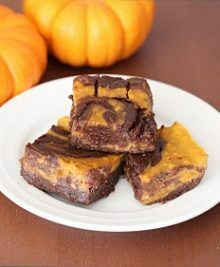 I am making these now! I accidentally cut one on half…. to excited I guess! Can’t wait to see how they come out! Merry christmas guys! Love love love your blog! I hope they turned out how you hoped!